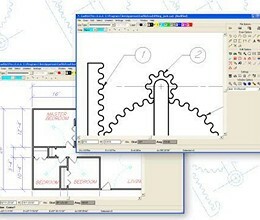 CadStd (pronounced "CAD Standard") is a simple and easy to use 2D computer aided design (CAD) program. Computer aided design replaced what used to be called drafting. CadStd is the result of thousands of hours of work and was written by a professional programmer and CAD user not by some committee. It is being used in several schools and universities around the world to teach their students how to use CAD. 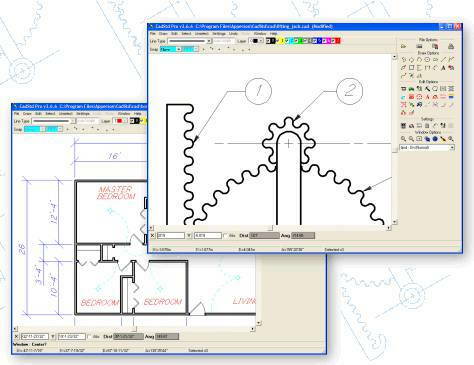 Since it is a general purpose CAD program it can be used for mechanical design, architecture, map making, wood working and many other vector oriented design projects. It has an accuracy of . 0001 of an inch and drawings can be as large as 3. 5 miles (In CAD everything is drawn at full scale so this is important). In addition CadStd Pro can be used to view and edit files created in HPGL which is the industry standard vector format used by most major companies that store CAD vector files in their product data management (PDM) systems. The Lite version is free and can read any drawing created by the Pro version. CadStd Lite can export files as DXF so you can share your drawings with friends who have other CAD programs like Autocad. The Pro version can create isometric projections from orthographic views, and has powerful commands like offset, trim, fillet and chamfer. Export drawings in formats like DXF, SVG, HPGL/1 or use copy clipboard to paste images into Office and other applications. Import DXF, HPGL/1 and Gedcom files. * CadStd Lite download link provides trial version of the software. CadStd Lite has been rated 3.0 out of 5 points. A total of 2 votes cast and 0 users reviewed the software.